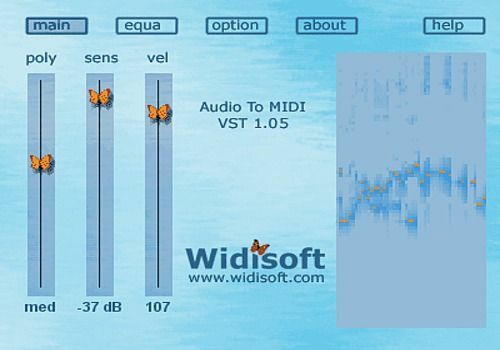 WIDI Audio To MIDI VST plugin automatically transcribes arbitrary polyphonic audio tracks into MIDI output. Unlike the original audio record, the MIDI output can be easily edited. You can use this plugin for instant Wave-to-MIDI transcription while playing a musical instrument. The resulting MIDI output can be played back "as is" or used to control MIDI-driven effects. To use this plugin, you need VST-compatible software.